John Mann's "charity" is funded by the William Pears Group, which is one of London's most notorious slum landlords. Mann assaulted an elderly person. That assault was shown on television. Why has he not been arrested? At the very least, if Labour expels Ken Livingstone, then it ought also to expel John Mann. "The long history of disgusting failures by South Yorkshire Police, its chief now suspended, ought to shut the Force for good. It is not just the blunders at Hillsborough in 1989 and the lies cops told. It's the brutality against miners at Orgreave in 1984 and the alleged perjury later." So opined The Sun yesterday. Yes, The Sun. Just as neither Theresa May nor anyone else objected to Andy Burnham's reference to Orgreave in the same breath as Hillsborough on the floor of the House of Commons. And just as no one quibbled with that same mention on Question Time. So of course the Blairobite knives are now out for Seumas Milne, the author of the superlative The Enemy Within, every word of which is now well on the way to being accepted as nothing more, nor less, than the simple facts of the matter about the Miners' Strike. Accepted as such by the Conservative Party. Accepted as such by The Sun. So much even for the Kinnockite version of events peddled by old Mirror Group hands from the era such as Paul Routledge. So much for, in many ways, the cornerstone of Thatcherism as an enduring cult. And so much for New Labour. Tony Blair's constituency began less than a mile from the venue of the Durham Miners' Gala. Not only did he always refuse to attend that event, but he used to appear on local television to proclaim his refusal to do so as a badge of honour. Whereas this year's Gala will be addressed by the Leader of the Labour Party. As well it might be. That the miners were right all along is now accepted even by the Tory Home Secretary. Yea, even by The Sun. The imam in the Bosnian mountain village spoke in flawless American English. Any suggestion that his area was an extremist stronghold was false, insisted Edis Bosnic. “We are enemies of the state only because we are calling people away from vice, drugs and alcohol and urging them to come back to decent values,” he said. The ultra-strict approach to Islam known as Wahhabism or Salafism which Mr Bosnic practises in the village of Gornja Maoca is spreading in Bosnia – and hundreds of parents blame its followers for recruiting their sons to fight in the battlefields of the Middle East for the Islamic State of Iraq and the Levant (Isil). Some 250 Bosnians have gone to fight in Syria or Iraq since 2012 – the biggest proportion of the population of any European country except Belgium. Around 45 have been killed and around 50 have returned home. Sefik Cufurovic is one of the bereft parents. He said his son, Ibro, received weapons training in Gornja Maoca after disappearing from his home 200 miles away. Now the 21-year-old is somewhere in the Middle East, and a wanted poster on Interpol’s website says he faces charges of “organising a terrorist group”. Apart from the Interpol picture, the only photo Mr Cufurovic has of his son is a snapshot of a fair-haired child on his mobile phone. Ibro went from being a model student to a radical Islamist in a very short time, said Mr Cufurovic. Before he left his home, he tore up all the photos that existed of him and told his father he was a bad Muslim. “I won’t go to your funeral when you die,” he said. The man who Mr Cufurovic blames for this transformation is the previous imam of Gornja Maoca, Husein “Bilal” Bosnic, who was sentenced last November to seven years in jail for promoting jihad and recruiting for Isil. Mr Cufurovic appeared as a witness in the trial that revealed the imam, who is no relation to Edis Bosnic, to be a central figure for Bosnian radicals. The case was a reminder that this nation of 3.8 million people, which has applied to join the European Union, has a growing problem with radicalisation. Bosnia was one of several Balkan states which last summer raised their threat levels after Isil released a propaganda video showing Balkan fighters threatening to spread jihad to south-eastern Europe. The village of Gornja Maoca is one of a number of Wahhabi communities that Bosnian counter-terrorism forces are keeping a close eye on. Husein Bosnic was arrested there. Another notorious figure who lived there is Nusret Imamovic, who the US State Department lists as “Specially Designated Global Terrorist” for his alleged role as a senior figure in Jabhat al-Nusra, the Syrian affiliate of al-Qaeda. Last year, Bosnian special forces police raided the village after photos emerged showing houses displaying the black flag of jihad. Edis Bosnic admitted some of his neighbours had left for Syria, but said they were misguided. “Some are behaving like Assad,” he added, referring to Syria’s bloodsoaked dictator. The imam said he condemned the terrorist attacks in Paris and Brussels “as much as I condemn French air strikes in Syria”. Mr Bosnic also said Isil had “deviated from the path” of true Islam, and denied there was a terrorist training camp in or near his village. Dragan Mektic, the Bosnian security minister, told the Telegraph there were no training camps in the country, but there is evidence that camps intended to prepare Bosnians for jihad did – or still do – exist. During the civil war between 1992 and 1995, hundreds of foreign fighters, mostly Arabs, arrived in Bosnia to fight alongside their Muslim co-religionists against the Serbs. Today, the authorities say there are about 3,000 Salafist fundamentalists in Bosnia, a fraction of the country’s 1.6 million Muslims. But the government adds that the number of Salafists is increasing. Osve, another village inhabited by Wahhabis, lies 50 miles west of Gornja Maoca. Izet Hadzic, its imam, also flatly rejected any links to extremism and said he had received death threats for speaking out against Isil. He is the former frontman of a heavy metal band called Black Lady who gave up alcohol and music to devote himself to Islam – although he rejects the terms Salafist or Wahhabi. “There is no terror training camp here,” he said, as his wife, clad in black with a veil revealing only her eyes, hung out the washing in the garden. Mr Hadzic said the two families from Osve who had gone to Syria were trouble-makers and not part of the community. The village still has some Serb residents, who had only warm words for their Muslim neighbours. Another area where Wahhabis set up is in the far north, next to the Croatian border. “It’s no surprise that they moved here,” said a retired policemen in the area. In Velika Kladusa, the region’s main town, many locals have tales of their sons being radicalised or stopped at Sarajevo airport as they attempted to travel to Syria. Sefik Cufurovic bitterly regrets he was unable to stop his own son travelling there. He is now worried about another of his offspring. “I’m afraid Serif (his stepson) is being radicalised. He's started attending prayers with the Wahhabis,” he said. But ministers argued that the new law also retroactively applied to people whose sanctions had been imposed before the law was passed. The High Court and Appeal Court have now both ruled that the retroactive legislation is not lawful, however. “We have … held - upholding the decision of the High Court - that in the cases of those claimants who had already appealed against their sanctions the Act was incompatible with their rights under the European Convention on Human Rights,” Lord Justice Underhill said. The sanctions had originally been ruled unlawful because a court said the Government had not provided sufficient information to claimants on how to make representations before benefits were stopped. That ruling was won by university graduate Cait Reilly, from Birmingham, who challenged having to work without wages at a local Poundland outlet. The sanctions system has been widely criticised, including by MPs on the Work and Pensions Select Committee. A report by the committee suggested the system might be 'purely punitive' and not aimed at helping people find work. The Government had originally feared that up to £130 million could be paid back in refunds, but the DWP now believes it will only have to pay back under £2 million because of the limited scope of the judgement. The latest court judgement is the latest in a string of legal setbacks for the Government’s benefit reforms. The controversial “bedroom tax” was branded “discriminatory” and “unlawful” by a court in January of this year. Last month the Department also lost a legal challenge to keep problems with Universal Credit under wraps after a freedom of information request from campaigners. Whinge all you like, and I certainly do, about the coverage of the Labour Party. But consider that it proves one very important thing. No one, absolutely no one at all, is remotely interested in the Conservative Party. Imagine that Jeremy Corbyn were removed as Labour Leader by the Hard Right that seems to have taken over the Parliamentary Labour Party when no one was paying attention. In that event, enough local candidates would arise spontaneously that the net result would be a doubling, and perhaps even a trebling, of the Conservative majority. Some of them, some of us, might even be elected. All that you need to be is the First Past The Post. Naz Shah made it into Parliament. As did each and all of this week's Hard Right hysterics, from John Mann up the food chain. Liz Truss is in the Cabinet; as ever, give that a moment to sink in. Matt Hancock hovers on the edge of it. So we could do it, if we put our minds to it. I for one certainly would put my mind to it. "American sports network ESPN, as part of its 30 for 30 series of sports films (under a new Soccer Stories subdivision), aired the documentary Hillsborough as a co-production with the BBC. "Directed by Daniel Gordon, the 2-hour film chronicles the disaster, the investigations, and their lingering effects; it also included interviews with survivors, victims' relatives, police officers and investigators. "Hillsborough aired the first time on 15 April 2014, the 25th anniversary of the disaster. "The documentary was unable to be shown in Great Britain upon initial release due to the 2012 High Court inquest still being in progress and the UK's jury tampering laws; the documentary contains previously unreleased security camera footage from the stadium the day of the disaster. "However, upon the inquest verdict the BBC announced they would air the documentary, with additional footage from the inquest and final verdict." I am proud of the fact that the Labour Party took steps yesterday to remove those who make anti-Semitic remarks from the party. The scourge of anti-Semitism is a dangerous and unwelcome phenomenon. I am glad that Jeremy Corbyn took decisive action to distance the Labour Party from the claims made by Ken Livingstone. Any party that claims to represent all of the people must be entirely inclusive and opposed to any form of racism or discrimination. As a Labour supporter, I like many others make fighting all forms of discrimination my life’s work. We do not need a debate about whether or not to oppose this form of racism - as to opposite it is in the blood of real Labour supporters. But while I welcome Jeremy Corbyn’s remarks and the Party’s decision to suspend those who have made anti-Semitic remarks I am forced to confront a double standard that has emerged in our society. The level of scrutiny applied to Ken Livingstone’s remarks was completely correct. It is a shame that we do not see this level of scrutiny applied to Tory ministers who make disparaging remarks that are similarly discomfiting. 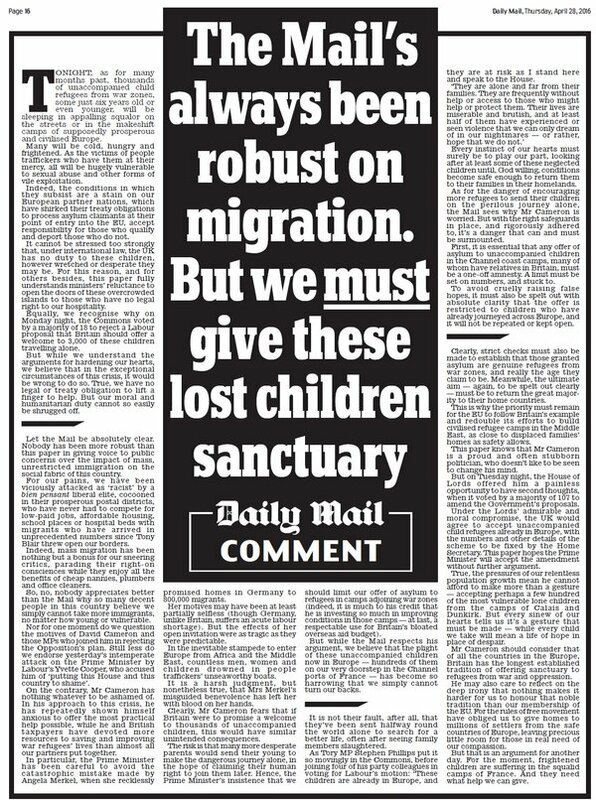 The most obvious example of this is Boris Johnson’s remarks in a column for The Sun during Obama’s UK visit last week. As Obama openly campaigned for Britain to stay in the EU, Brexiteer Boris suggested that the “part-Kenyan” president might have an “ancestral dislike” of Britain, and that this could have factored in to his decision to urge the UK not to stay in the European Union. It was a low blow, and he faced accusations of “dog whistle racism”. When the Prime Minister was asked to comment on the saga, he simply said that “questions for Boris are questions for Boris”. Unfortunately this is not good enough. When the Mayor of London and one of his own MPs makes such racially charged remarks, it is a question for David Cameron, just as yesterday Jeremy Corbyn was rightly asked to comment on the issues within the Labour Party. “Dog whistle racism” is a phrase many have thrown around recently in reference to Tory tactics, not least in the case of Zac Goldsmith’s campaign for London Mayor. The Conservative candidate has released statements decrying Sadiq Khan for “giving platform and oxygen to extremists”, going as far as to suggest that he has provided “cover for extremists”. The Evening Standard ran the front page headline “ZAC BLASTS SADIQ OVER EXTREMISTS” a few weeks ago, which voiced concerns that Khan had met with a radical “extremist” imam. It subsequently emerged that Goldsmith had posed for a picture with the same imam, that the imam is in fact a Tory himself, and that he was invited to a meeting to help canvass for the party by Dan Watkins last year. Yvette Cooper has suggested that the Tory campaign against Khan amounts to “don’t vote for him, he’s a Muslim”. Cooper was drawing on the fact that Goldsmith’s campaign has labelled Khan “radical”, “divisive” and “dangerous” while publishing leaflets to the British Indian community warning that Khan secretly plans to tax their jewellery. There is no hierarchy of racism. Discrimination in whatever form it rears its ugly head is wrong and damaging, and should have no place within society, never mind politics. Labour is taking steps to sort this out within their own party - and it is time the Tories sorted themselves out too. Two separate stories that have dominated the media over the past few weeks, on either side of the Atlantic, have been instructive in highlighting the subtle ways in which our political leaders are influenced by the company they keep – and why this has led to such a big divide between them and those they are supposed to serve. In the US, Hillary Clinton has been under scrutiny over speeches she gave to banks, including Goldman Sachs, in return for six figure sums. Bernie Sanders, her rival for the Democratic nomination in the Presidential race, has stepped up his attacks on Clinton over the issue. In a televised debate ahead of this week’s New York primaries, Sanders was asked by debate moderator Dana Bash to ‘name one decision that she made as senator that shows that she favoured banks because of the money she received’. In his response, Sanders referred somewhat vaguely to the lack of action to deal with the ‘fraudulent operators’ responsible for the 2008 financial collapse. To Clinton, this was proof that she had done no wrong: ‘he cannot come up with an example, because there is no example’. While this has been questioned — Senator Elizabeth Warren alleged in 2004 that Clinton had been directly influenced in a Senate vote by corporate money — asking for a specific example largely misses the point about the way big corporations exert influence on political decision-makers. Rather than Clinton being influenced by a suitcase full of money with a list of instructions at the bottom, influence is applied far more subtly. Quite simply, when you spend most of your time rubbing shoulders with financiers, chief executives and other millionaires — and when they become the people you most readily identify with — you are more likely to share their views. But everybody else doesn’t get paid hundreds of thousands of dollars to speak to a room of Gordon Gekkos for a couple of hours. Bernie Sanders doesn’t. Ordinary American workers don’t. Sure, she was referring to other politicians who have received similar sums for private speeches – but to ignore legitimate questions about how her decisions as President would be affected by her close relationship with banks by saying ‘well, other people do it too’ is simply not a valid response. Which brings us to the UK’s related story. The leaked Panama Papers showing that David Cameron benefitted from money held offshore by his father didn’t expose any illegal activity by him or his father. But it did further highlight just how different Cameron’s life is to the vast majority of the British citizens he is supposed to represent. And, one might add, why would clamping down on tax avoidance be a priority for Cameron when he’s grown up seeing it as an acceptable form of financial management? It is important to highlight the fact that the Panama Papers exposed far worse wrongdoing by other political leaders: the revelations about the financial affairs of close associates of Russian President Vladimir Putin and Pakistani President Nawaz Sharif, for example, show what real corruption looks like. I’d rather live in the UK or the US, where there are at least reasonable checks and balances on our political leaders than one, like Russia, where its President can take vast sums of money from public reserves and prevent the media from reporting it. But just because the political systems in the UK and the US are better than in other countries, doesn’t mean we have to settle for it. After all, we live in a country where a minister was discovered to be secretly handing information to a private company he was supposed to be regulating, and actually ended up being promoted. We live in a country where politicians are quite happy to spend billions of pounds to rescue banks (the kind of people they socialise with), but show reluctance to offer any help to steelworkers (the kind of people they don’t encounter so often). No wonder levels of trust in politicians are so low. The stories about Clinton and Cameron don’t show them to be corrupt politicians. But they do show that it’s a problem when our politicians are too close to bankers and chief executives (the one per cent, to use the language of Bernie Sanders) and too far removed from the lives of ordinary citizens. We need to talk more about the political funding system, the lack of politicians from lower income backgrounds, and the ‘revolving door’ that sees ex-politicians move seamlessly into top business positions. Until we do, disaffection, distrust and outright hostility will continue to characterise the relationship between politicians and the people. It’s not Saudi Arabia which suffers from “oil addiction”, it’s we who are addicted. The unique Saudi drug – a cocktail of wealth, arrogance and infantile Puritanism – is far more dangerous, since it depends on the arithmetic (or myth) of its 716 billion barrels of oil reserves. The source was Sadad al-Husseini, the former head of exploration at Aramco. He later angrily explained that he’d been misrepresented by the American diplomats whose note, already at least six years old, contained “many patently inaccurate statements”. But back in 2004, oil analysts such as banker Matthew Simmons, after studying 200 technical papers on Saudi reserves, were saying that the country’s oil was “peaking”, its oil fields already damaged by using salt water to maintain pressure. These rumours were only reinforced by Saudi Arabia’s refusal to reveal any details of their reserves. Thus, Prince Mohamed’s promise that a privatisation of Aramco would increase transparency and limit corruption will be viewed with the usual scepticism. But like the women who will supposedly have a larger economic role and the expatriates who will have an “improved status” in the country (though this surely doesn’t apply to the armies of Indian, Bangladeshi and Pakistani labourers in Saudi Arabia), we’ve heard it all before. “It is wide open for an ideology which would purge it of its unease and guilt without materially reducing its privileges. Woollacott, let us remember, was writing before the Taliban, before al-Qaeda, 20 years before 9/11 and its 15 Saudi hijackers – and 33 years before the emergence of Isis. And this, of course, was what was missing from Prince Mohamed’s triumphalism this week. How can we listen to the good Prince saying that “we will not allow our country ever to be at the mercy of commodity price volatility or external markets” when Saudi Arabia is, in truth, at the mercy of an army of head-chopping, anti-Shiite puritans who support the assault on Yemen (which, with eight other nations in tow but with futile inappropriateness, was code-named “Operation Decisive Storm”), and regularly express their loathing of Iran, Syria, and many of the Shia Muslims in Lebanon? No wonder, as the Washington Post revealed this month, the Saudis are spending millions on Washington’s top law, lobby and public relations companies to promote foreign investment in the Saudi economy – some of them, according to the paper, “tasked with coming up with content for the [Saudi Washington] embassy’s official Twitter and YouTube accounts”. The PR firm Qorvis, it turned out, also ran the Twitter account for the Syrian Opposition Coalition. Firms like Podesta, BGR Government Affairs, DLA Piper and Pillsbury Winthrop are trying to raise the Kingdom’s “visibility”. After threats to release the missing – or “redacted” – pages of the 9/11 report, Barack Obama’s snotty criticism of Gulf “free riders” in his Atlantic magazine interview, and the Clinton-Sanders support for US families who want to sue foreign governments like Saudi Arabia for 9/11, these PR firms have a lot of work to do – and a lot of money to make. Interestingly, the Podesta Group – with a $140,000 monthly contract with the Centre for Studies and Media Affairs at the Saudi Royal Court, was founded by Tony Podesta, a Democratic lobbyist and major contributor to La Clinton herself. And all this without mentioning that oil still floats away from the Gulf at scarcely $35 a barrel. Or about the unchanging and absolute nature of the Saudi monarchy. Or about Saudi education reform or tax revenue. Or about a Saudi woman’s right to drive a car. Or about the decapitations that the Saudis still inflict on those who trade in drugs. But not on those, of course, who suffer from that most dangerous of narcotics: oil addiction. This is excellent news as it should save on counselling. For example, Paul Middup, who as chair of South Yorkshire Police Federation blamed the disaster on a “rampaging mob”, has refused to make a further statement. And he’d say “no, not really”, and the session would be over, saving on costs all round. In any case, it’s a shame to stifle people’s creativity. Instead of boring us with dull tedious facts, it’s more exciting if the police and press feel able to invent rampaging mobs after a tragedy. It’s a pity they weren’t allowed to let their imagination flow, blaming the crush on a stampede of Scouse buffalos up the Leppings Lane, or aliens shaped like giant stick insects who zapped the fans in revenge for a galactic war between Liverpool and the Argons. Another police spokesman claimed that training had been stepped up since the mistakes in 1989. That must be right, because it’s a highly skilled art, learning how not to invent a galaxy of stories blaming victims for their own deaths. It also suggests our society is now controlled by new age liberals, as the police falsified at least 116 statements, which we’ve known about since the last inquiry, and no one’s yet been punished for it. Because it’s wrong to see these police officers as liars, they’re suffering from Compulsive Statement Alteration Syndrome, and we shouldn’t be negative by saying they make stuff up but recognise they're “differently realitied” – which is why many of them have been promoted, to raise their self-esteem. It now appears the police may have put some families of those who were killed under surveillance. You can understand this, because one of the biggest threats to the public is grieving families after a tragedy. It might be best if this became compulsory: whenever someone dies, all their family is locked up for a year or two, to ensure the public is kept safe. The evidence suggests it’s unfair to say the police were incompetent, as they were extremely well organised. It takes planning to falsify 116 statements. To invent and co-ordinate a story about broken-down gates and drunk ticketless fans, when thousands saw that wasn’t true, takes care and precision, so let’s not criticise them unduly. But they were conditioned to seeing working class crowds as hooligans. So, Chief Inspector Duckenfeld, in charge of police procedure, said all his attention was on “misbehaviour”, and he wasn’t familiar with the ground. And when police saw chaos, they assumed it was a riot. Even afterwards, they ordered blood to be taken from the dead to test for alcohol, and police photographers took pictures of discarded beer cans to prove drunkenness. Maybe they were just being thorough, and thought: “Just because someone’s been crushed to death doesn’t mean they shouldn’t be arrested for being drunk and disorderly”. To spread this story they needed the press, and The Sun’s headline was delightfully helpful. Editor Kelvin MacKenzie now says he wasn’t to blame for his front page ‘The Truth’, about drunk fans stealing from the dead, as he was only reporting what he was told (correctly adding that “it would have been far more accurate had I written the headline ‘The Lies’, rather than ‘The Truth’”). And it’s always been a golden rule of journalism, to print stories without apparently wondering whether they may have been told to you by someone desperate to get themselves off the hook for causing a disaster, under a headline: ‘THE TRUTH’. If only The Sun had been around when the Titanic sank. The captain could have got himself out of trouble by telling them a rampaging mob of Liverpool fans threw icebergs into the Atlantic. If Colonel Gaddafi had any sense, he’d have told MacKenzie he was just about to order free and fair elections when Liverpool fans without tickets broke down his door, and now he can’t do anything as he’s waiting in for the council to come and fix it. This week The Sun made up for its over-excitement at the time, by making no mention on its front page of the verdict. But to be fair, if The Sun had to mention it on the front page every time they’d printed a wrong story, there’d be no room left for them to concoct new stories, and then where would our free press be? And if they apologised for every time they’ve written unfair bile, it wouldn’t fit in the paper, they’d have to publish a 78 issue easy-to-collect week-by-week A-to Z compendium of grovelling retractions (order week 1, get week 2 free!). Between the police and the press, a magical world was created, in which everything was beautifully upside-down like in an old children’s story. The people whose job was to protect the law acted unlawfully and defended unlawfulness for 27 years, while the people assumed to be unlawful thugs had to fight for the law to be upheld by the law protectors, while the people whose job was to expose the truth accepted at face value what turned out to be extraordinary lies. There should be more stories like this, in which plumbers come to your house when your plumbing’s fine and smash holes in your radiators with a chisel, before blaming the people who spent all night mopping the carpet, saying they were stealing the mop. Or dustmen coming round once a fortnight and noisily tipping rubbish in your kitchen, and then say, “Look at the mess you've made, you're drunk”. What a wonderful, magical world we would all enjoy. In April 1989 I was about to fly home from Delhi after several months in India, some of them spent travelling along the banks of the Ganges in Bihar and Bengal. News from home had been nearly always bad. It had been a winter of British disasters: crowded trains came off the tracks at Clapham and Purley in south London; a Pan Am 747 exploded over Lockerbie; another plane crash-landed on the M1 at Kegworth in the east Midlands. In these four episodes between mid-December and early March, a total of 357 people died, having their lives taken from them by faulty railway signalling, aero-engine malfunction and a terrorist bomb. Indian television was then a state monopoly that tended to present national affairs through a formal prism in which men in suits and women in saris met each other and exchanged garlands. Now these local items were interspersed with footage from Britain of shiny wreckage and rescuers working under arc lights; as though Britain, not India, was where questions of life and death were at their starkest, and chaos most likely to break out. Hillsborough happened the night before I left. Watching the news on TV, my old landlord in Delhi remarked that football in England must have what he called “a religious dimension” and I knew exactly what he meant. The colours, the scarves, the chants, the devotion to a particular rather than a general deity: a similar fervour could be found in India’s religious crowds. In fact, I’d gone to the Ganges partly because of such a crowd. An overcrowded ferry had overturned downstream of Patna the previous year, drowning 400 or 14 (estimates varied wildly) of the Hindu pilgrims on board who, dressed in saffron robes and chanting, were travelling to a shrine across the river. This kind of accident was – and is – a common enough event in eastern India and Bangladesh, and I thought it would be interesting to find out what the causes were – whether it was the ill-discipline and panic of the crowd, the mistake of the skipper, the frailty of the craft or the sloppy regulation of the police. Georges’ words caused a storm in England and later he apologised for them. But at the time his description stood out only because it came from a foreigner. According to Irvine Patnick, the then Tory MP for Sheffield Hallam, the police at the stadium had been “hampered, harassed, punched, kicked and urinated on”. Paul Middup, the chairman of the South Yorkshire Police Federation, said some of the crowd outside the gates were “uncontrollable … a great number of them had obviously been drinking heavily”. Patnick apologised shortly before he died in 2012 ; Middup has said he was simply repeating what police officers present at the ground had told him. We know now that their descriptions are untrue – that the reasons 96 people died lay in many directions, but not with the dead themselves. From the beginning, the police version of events was contentious. Why was it so widely believed? In the face of so much contrary evidence, what gave the police the confidence to lie? Part of the answer is that in 1989 the public was less doubting of authority, and the legal establishment less doubting of the police: the big verdicts – the Birmingham Six, the Guildford Four, the Tottenham Three – had still to be overturned. A bigger reason is that by 1989 many people were prepared to believe almost anything of the English football fan. The game’s reputation had never been lower. A famous definition appeared in a Sunday Times editorial published after the Bradford City stadium fire on 11 May 1985, in which 56 people died. Football was “a slum sport played in slum stadiums increasingly watched by slum people, who deter decent folk from turning up”. A little over a fortnight later, this general repugnance found a particular focus at the Heysel stadium in Brussels when, just before play began in the European Cup final, Liverpool fans attacked Juventus fans and 39 people, none of them Liverpool supporters, died in the crush. The game went ahead for reasons of public safety; it was Jacques Georges who presented Juventus with the trophy. Fourteen Liverpool fans were jailed for manslaughter and English teams banned from European competitions – a ban that had still to be lifted at the time of Hillsborough. Liverpool were singled out for special punishment with an extra year’s exclusion. The victims of the disasters in Bihar and Hillsborough had more in common than the habits of devotion. There is this thing called class. The ferry passengers who died tended to be described by the local elites as “uneducated … ignorant … backward”. According to the ferry owner’s son, they’d drowned because of their “panic and stupidity”. Nobody quite said this of the Hillsborough dead, but the feeling of “them” and “us” existed, encouraged by recent footballing history and the fact that they had died behind wire fences in areas described as pens, the same as to hold sheep. “All of it would have been familiar to a citizen of Bihar,” I wrote a few weeks later. I rather regret that piece now. By acknowledging confusion, it ducked the need to decide what had happened. It was tone-deaf to grief. “The lessons Hillsborough has taught us” is now a media trope. What it taught me – or rather confirmed in me – is the belief that good reporters matter in the media above all else, because without them we can never get near to confidently knowing the truth of an event; unless, of course, we ourselves have been the unfortunate witnesses. One week before elections of one kind or another on every inch of the United Kingdom, the Police are preparing to prosecute 26 Conservative MPs who won their seats by cheating. That is more than double the Government's majority. That is the news. Why is there any other? Never mind the antics of a retired politician with a little-heard radio phone-in? The BBC spent 27 years not broadcasting the footage the proved the truth about Hillsborough. It directly faked the television coverage of Orgreave, which is next. If the Government wanted to privatise the BBC, then why should the Left object? What has it ever done for us? In 2020, at least if Jeremy Corbyn has been removed as Leader of the Labour Party, then David Lindsay will contest the parliamentary seat containing the County Durham country town of Lanchester. I had to pull out of standing for Parliament in 2010, following repeated hospitalisations. I am still not well. I never will be. And anyway, we got Pat Glass. But, Pat or no Pat (that's politics), I will stand for the seat into which the boundary changes had placed Lanchester in 2020, no matter what, if the lackeys of Goldman Sachs and the House of Saud had removed Jeremy Corbyn as Leader of the Labour Party and replaced him with some Hillary Clinton in drag. And, in that event, I will be the first past the post. The campaign itself starts the moment that Corbyn falls. The planning for it starts at this moment. Sadiq Khan has joined the coup against Corbyn. It is now imperative that he be elected only on the second preference votes of George Galloway, of which there need not be very many at all for that purpose. And it is imperative that Galloway then win the Tooting by-election, which he has already been contesting for a month, and the vacancy has not even arisen yet. Do we think that John Mann has ever read Mein Kampf? He puts the "lower" into "lower middle class". Like most of those who are openly attempting to stage a coup against Jeremy Corbyn in order to save their own seats from, horror of horrors, members of the Labour Party who are neither extremely few in number nor extremely advanced in age. I write this as someone who thinks that Ken Livingstone went off the boil a long time ago, while Naz Shah, who has never been a Corbyn supporter, ought never to have been allowed in public life in the first place. But is Livingstone really one of Corbyn's oldest and closest friends and allies? During one of Livingstone's two failed attempts to get onto the ballot for Leader, he announced Corbyn as his running mate for Deputy Leader without even having asked him first. Whereas, at his own only attempt, Corbyn not only made it onto the ballot, but won the election itself by a mile, and has now suspended from very party membership the man who once thought of him as his office boy. Watch your backs. And I mean that as compliment to man wielding the dagger. First Hillsborough, and now phone hacking. There will be no Sun by the time of the 2020 General Election. It will be long gone by then. How very foolish the Corbyn Coup Plotters will look then. Replace Corbyn with a Leader acceptable to whom or what, exactly? And why, exactly? I can spot only one Jew (in an almost honorary position) among the members of the present Cabinet, plus one more who attends. This is the least Jewish Cabinet in several decades. But then, how many Jews have ever been members of the Bullingdon Club? What would be the reaction of the lovely Sam Cam if one of the children expressed the intention to marry a Jew? And so, South Yorkshire Police limps, or possibly hurtles, towards disbandment. Notice that neither Theresa May nor anyone else has disputed Andy Burnham's almost casual observation that this was as much about Orgreave as it was about Hillsborough. That point has been conceded in silence. If David Duckenfield is still alive and still in this country, then he will not be at liberty for much longer. Not only, although certainly, because his removal from circulation will very soon become essential to the maintenance of public order in at least one major city. He will then be an awful lot safer than he is now. But what of Kelvin MacKenzie? He is now effectively walking around with a target on his back. They must be able to come up with some offence with which to charge him, in order to extend to him the protection of incarceration. It is for his own good. Now that it’s increasingly likely that Donald Trump and Hillary Clinton will be the two major candidates for president in the general election, voters are once again left without a true anti-war candidate, or even a decisive break from the last decade and a half of disastrous foreign policy. We already know there’s barely ever been a military engagement that Clinton didn’t like. And Trump confirmed on Wednesday in his “big” foreign policy speech that he will be a chaotic and unpredictable aggressor whose opinion changes with the wind. When Bernie Sanders leaves the race, there will no longer be a credible voice saying that more bombing is not necessarily the answer to solving all the problems in the Middle East, many of which were caused by bombing in the first place. Trump started off his speech on Wednesday by reading from a teleprompter in a rambling and incoherent manner, declaring that Obama has “depleted” our military (false), the Iran deal was the “worst agreement” (why?) and that we don’t support Israel, “a force for justice and peace” (absurd) – hallmark Republican conventional wisdom talking points. He then did say some things that suggested he would not look to immediately start new wars in the Middle East and elsewhere, but it’s hard to take anything he says on the subject seriously. He swung wildly from one position to its opposite on multiple occasions, contradicting himself at various times from comments he made years to mere minutes prior. For example, he said that bombing Libya was “a disaster”, but he then questioned why we aren’t still bombing Libya right now. Yet he’s bragged in the recent past about wanting to bring back waterboarding, or “much worse”, killing terrorists’ entire families, and would not be opposed to using nuclear bombs, even in Europe. He remarked that there’s “too much destruction out there – too many destructive weapons,” but just five minutes earlier in the speech, he said the US’s nuclear arsenal was in dire need of “renewal”. While Trump’s foreign policy seems random and unpredictable (he actually bragged about this), it’s hard to see how Clinton’s approach to war is much better. Clinton has run on a more hawkish foreign policy than most Democrats and Republicans. As many have pointed out, her positions are often more militaristic than anyone else in the race. She is in favor of a no-fly zone in Syria – a euphemism for declaring war on the Assad regime on one side, while also bombing Isis on the other. She was for the Iraq war, the 2011 Libyan war and the Afghanistan surge. She also counts among her friends unindicted war criminal Henry Kissinger, and she has neocons already lining up behind her rather than supporting Trump. This is not to say Trump and Clinton are the same when it comes to foreign policy – there is plenty of legitimate disagreement. Trump’s xenophobic call for a ban on Muslim immigrants and open calls for torture come to mind. But on a lot of issues, like the Isis war, praise for dictators and trillions of dollars in military spending, voters are left with a similar choice on foreign policy as they had in 2012. Now the only question is which candidate will be elected to continue expanding the $2tn, never-ending war on terror that has already spread across the Middle East. Nearly 10 years ago, possibly even that long, I did some market research work in Ushaw Moor. I saw a peacock walking down the street. It was accepted by the residents as the most normal thing in the world. If the Republicans nominated someone other than Trump, then Clinton would be indicted over her emails. But if the Republicans nominated Trump, then expect the fraud case against his "university" to step up several gears. Although only if the Democrats had nominated Clinton. Is it wrong that Ted Cruz's naming of Carly Fiorina as his running mate makes me think "The cart before the horse"? How many Jews have ever been members of the Bullingdon Club? I mean that as an entirely serious question. If anything, so long as they came from old princely families in Arabia or on the Subcontinent, then Muslims would be far more likely to get in. Pretty much by definition, rich Jews are "trade". And we all know what the likes of David Cameron think of that. Naz Shah's own party is not alone in having questions to answer about her. For example, Louise Mensch jetted in especially to support her. The right-wing press and blogosphere, of all parties, howled in support of Shah because of who she was not, and they went bananas with joy when she won. What do they have to say for themselves now? When the latest Dubs Amendment comes back to the Commons, then will the Government dare to vote it down? There are a lot of bad things that could be said about Yvette Cooper. But she is spot on this time. 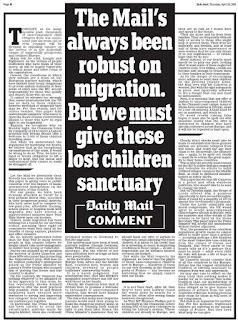 Of course it is not a criticism of our neighbours that their relevant institutions and resources are simply overwhelmed by all these unaccompanied children. As Britain's would be. Britain would seek to share the load, and they are doing nothing other than the same. We had the means and the will to bomb these children's countries. Supported by Yvette Cooper; see, I told you. Therefore, we can find the means and the will to take them in, proportionally, in co-operation and co-ordination with our neighbours. We can. We must. And we may now dare to hope that we will. Not a murmur of dissent from the Conservative benches when Andy Burnham listed Orgreave alongside Hillsborough and Rotherham. Even they now admit it. Watch that space. Meanwhile, if David Duckenfield is still alive and still in this country, then he is far and away the most dangerous man in Britain today. There is not even anyone in prison who has been found criminally culpable of the deaths of ninety-six people. And yes, even though it is not in itself a conviction, that is what the verdict of unlawful killing means. It would be beneath the dignity of Ian Brady to have to share a cell with him. But if he has in fact committed suicide, then who could blame him? You could not write a novel or a play about the man who ended up as the sole defendant in the trial of everything that had been done to the North of England during the Thatcher years, of everything bad that had been done to the working class and its ancestors in England since 1066, of everything bad that had ever been done to Liverpool, behind that of everything bad that had ever been done to the Irish, and of everything that anyone who happened to be a Police Officer had ever done to annoy anyone who happened not to be. I mean it. Try it. Try writing that novel or that play. Try pitching it to Radio Four. Yet, if Duckenfield is still with us, then we are going to see that very trial. Not in the courtroom, of course. Or not much. But in the jury room. And in every pub. At every bus stop. Everywhere. Can you be a candidate for Leader of the Conservative Party while not in receipt of its Whip? Would you stand any chance of winning? If David Cameron really cares tuppence about Hillsborough, then he will withdraw the Whip from Boris Johnson. What would follow from that, would follow from that. Ho, hum. As for the withdrawal of the Whip from Naz Shah, this is Jeremy Corbyn's opportunity to stamp his authority on those who were so desperate to remove, among other things, the pre-eminent pro-Palestinian politician in the Western world, that they were prepared to put up pretty much anyone at all against him, without anything so tiresome as vetting. Shah comes across a racist and sexist stereotype. Is this woman of Pakistani extraction a doctor, as many of them are? No, she is barely literate. But she has been chosen because she has a (highly contested) history as a victim of forced marriage and of domestic violence. It is within the power of the House of Commons to expel a member, and the Conservatives have the majority with which to do it. But they will not use that majority. They can do without yet another failure to capture what was one of their target seats a mere six years ago. They can do without the election of a pro-Corbyn Labour MP. Alternatively, they can do without the election of a Respect MP. And, quite apart of the question of what many of them really think of Jews, it suits them down to the ground that the most prominent British Pakistani woman in Parliament should be barely literate and a professional, if even a genuine, victim, whose daft Internet comments prove that she has never been active in the Palestinian cause in her life, and who then apologises for them to the wrong people. A very large number of the supporters of Bernie Sanders would not vote for Hillary Clinton. They are not partisan Democrats. They do not even like the Democratic Party, about which there is no shortage of things to dislike. They are in it only in order to nominate Sanders. He himself joined it for the first time only last year, in his seventies. If he were not on the ballot, then they simply would not vote. They have no political reason to vote for Clinton, who is against everything that they stand for on the economic and foreign policy issues that move them. The Culture Wars of well-heeled Baby Boomers mean nothing to them, and the War Wars of well-heeled Baby Boomers are positively abhorrent to them. I might go into hospital today. People pay a fortune to be guaranteed to be seen by a consultant. Today, as yesterday, we can all get it for free. Each is the only candidate that the other could beat. Neither The Sun nor The Times may consider Hillsborough worth mentioning, but The Guardian, for all its many and increasing faults, finds the room for David Conn's brilliant, devastating essay. For reasons too numerous to list, I have never understood why anyone in or from the North read The Sun. Its sensibility is entirely Southern. It is not that everyone from the South is like that. But everyone like that is from the South.